WALK-BEHIND SPREADERS for Sale in Londonderry, NH | DONOVAN EQUIPMENT CO. INC. Designed for reliable consistency and accuracy, FISHER® professional walk-behind spreaders are built to handle extreme winter conditions in Londonderry year after year. Our walk-behind spreaders feature sturdy construction and corrosion-free polyethylene and are ideal for walkways, short driveways and store entrances. Whether you're drop spreading along narrow walkways or broadcast-spreading across wider areas, property and facility managers can make quick work of ice control each winter. Each walk-behind spreader includes a stretch-fit cover that keeps material dry and provides visibility of spreader contents. 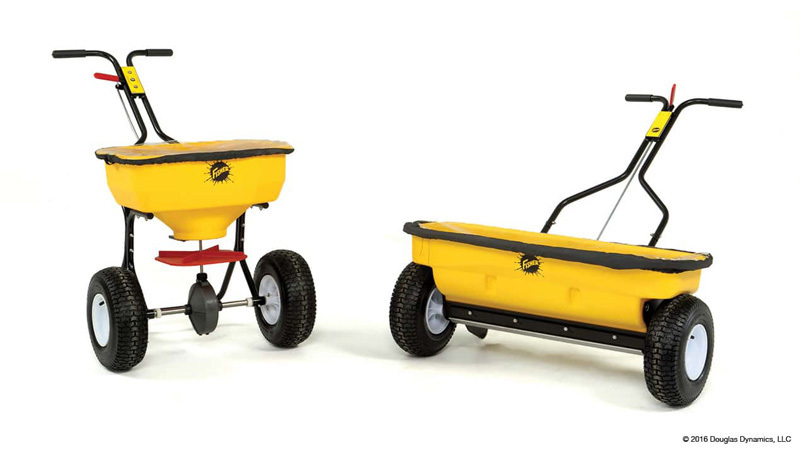 The broadcast and drop spreader models feature corrosion-free poly hoppers for long-lasting durability. On the WB-100B broadcast spreader, material is delivered to the spinner through a single, adjustable slot. On the WB-160D drop spreader, material is delivered directly to the surface through an adjustable 3' wide opening and features roller bars that agitate material for even delivery. The WB-100B broadcast spreader features a 10" molded spinner that delivers a spread pattern of up to 20' wide and provides long-lasting, corrosion-free operation. The WB-100B broadcast spreader and the WB-160D drop spreader feature a top screen, which helps break up large chunks of de-icing material during the loading process to prevent clogging while spreading. The 13" pneumatic tires provide enhanced mobility on icy and rough surfaces. A powder coated steel frame provides years of trouble-free performance. Dimensions Overall (LxWxH) 48" x 38 ¼" x 36" 50" x 26" x 28"
Thank you for submitting your request. We will respond at our earliest convenience. For immediate assistance, please call 603-669-2250 and reference this request.